Media and politicians never tire of unsubstantiated allegations about the fate of gypsies during the Third Reich, such as "more than a million gypsies were murdered during the Third Reich" and "500,000 Sinti and Roma died in the Holocaust." This article will show that such allegations are incompatible with population statistics for these nomadic tribes, both before and after World War II – statistics which are readily available to the public. It will be proved that the official figures for wartime gypsy losses are grossly exaggerated. "The Central Council of German Sinti and Roma has renewed demands for construction of a planned Berlin memorial to Sinti and Roma murdered by the National Socialists... The Central Council stated that the memorial to the 500,000 Sinti and Roma Holocaust victims, approved as early as 1994 by the City of Berlin, Parliament and Federal Government, should now be constructed. However, a spokesperson for the Berlin City Council denied that Berlin had promised to build such a memorial." The affair has reopened debate on the "500,000" number. This figure has to be re-examined, as has the justification for a memorial. No real evidence exists of the 500,000 alleged victims. There is no credible documentation for this figure, and no scientific inquiry into the matter has ever been made. If anyone disagrees with my assertion, I request that he or she notify this magazine and provide documentation including author, title, publisher, year, ISBN number, etc. For over 20 years I have been searching for information about competent investigations into this matter. The first question that arises concerns the basis for the claim of 500,000 victims. What is the origin of this number? In 1972, Donald Kenrich and Grattan Puxon wrote a book entitled The Destiny of Europe's Gypsies. Published in London, it was lauded as "the first scholarly history of this ancient people viewed as a Western minority" as well as an "important work of historical and social scholarship." In 1981 a German translation was published by Tilman Zülch of the "Society for Endangered Peoples" in Göttingen. In this translation, the objective, matter-of-fact title was translated as Sinti und Roma – die Vernichtung eines Volkes im NS-Staat (Sinti and Roma: the Extermination of a People by the Nazi State). The English word "destiny," which means "Schicksal" in German, was rendered as "Vernichtung," which means extermination., Someone really should do a scientific study of propagandistic translating! It is noteworthy that from England to Central Europe the number of victims increased from 219,700 to 500,000, quite independent of further murderous activity by "Nazis." Since that year, this number has been ceaselessly disseminated by Tilman Zülch and his "Society." Now that we know the origin of the number "500,000" our next question is: "Where is it documented?" Every public statement has to have some documentation. The following is an account of my attempts to find a documented source for this figure, which have so far been unsuccessful. "In particular I suggest you inquire with the Persecution Museum in Israel, which can be reached through Mme. Miriam Novitsch, c/o Etudes Tsiganes, 2 rue d'Hautpoul, F-75019, Paris 19eme." "There is also an organization of Gypsies, they claim reparation from the Germans as it is true that about 500,000 Gypsies were killed"
Mme. Novitsch was kind enough to repeat the charge, but she neglected to produce the requested documentation and cited no source whatsoever. I wrote to her again, specifically repeating the key question: "Or do you know the origin of this number?" but this time I received no reply at all. "To the knowledge of the International Tracing Center, how many gypsies died as a result of atrocities committed by the National Socialist regime?" "Regarding your letter (Points 1-12), we wish to inform you that the International Tracing Center has no documentary material or other information whatsoever, that would enable us to answer your query." Please bear in mind that the International Tracing Service has in its archives millions of documents, card files, etc. from every concentration camp or related institution. Nevertheless it is unable to verify the alleged murders of even 20,000 German gypsies, much less 500,000. Apparently no one except me has ever attempted to document gypsy losses through the Tracing Service, yet every major newspaper knows the exact number: 500,000! Isn't that amazing? Another organization from which we could expect accurate information is the official German Institut für Zeitgeschichte (IfZ, Institute for Contemporary History) in Munich. However, Hellmuth Auerbach of the IfZ responded to my inquiry by referring me to Kenrich/Puxton as well as a work by Christian Bernadac, who estimates the number at around 229,950. The Auerbach letter is interesting for what it indirectly reveals: at least as early as 1980, the Institute for Contemporary History knew that no documentation existed for the figure of 500,000. Nevertheless, during the ensuing 20 years it made no attempt to inform press agencies, the media, politicians, the German Federal Government, etc. that the stated figure of 500,000 was completely undocumented – snatched from thin air – and thus should not be used to the detriment of all Germans. "The total number of Gypsies killed by the Nazis is estimated at about 200,000." He too gave Kenrick/Puxon as his source. Once again, a major historical institute had no evidence whatsoever for the alleged figure of 500,000 victims and made no mention of studies, which demonstrate that the figure of 200,000 is also incorrect. Prominent historians, such as the British biographer of Churchill Martin Gilbert, are quite aware that the figure of 500,000 could not possibly be correct, as we read in his book The Holocaust. Gilbert, a member of Oxford's Merton College, is one of the most distinguished and versatile historians of England. He considers the number 500,000 to be a gross propagandistic exaggeration and expresses surprise that German politicians continue to deliberately disseminate misinformation in their official capacities even when they are no longer coerced by the occupying powers. "Please refer to the Gesellschaft für bedrohte Völker [Society for Endangered Peoples], Post Office Box 159, Göttingen." "In response to your questions, we refer you to Tilmen Zülch (Editor), "In Auschwitz vergast, bis heute verfolgt" [Gassed at Auschwitz, Persecuted to this Day], Reinbek, 1979, p. 121." "According to estimates by European Tsiganologists [specialists in gypsy studies], the Third Reich murdered around 500,000 men, women and children of this national group as part of its "Final Solution" although the full extent of this genocide has still not been determined." Unfortunately, the source for the statistics, which the Spiegel so uncritically disseminates, does not bother to identify its "European tsiganologists." The media never address the most important question! Der Spiegel's response does suggest another question for the logicians, however. After having been "gassed at Auschwitz" sixty years ago, how can a person or group be persecuted today? "At least a half million European Roma/Sinti fell victim to the racist policies of the Third Reich. [...] We therefore consider the following steps appropriate for the Federal Republic of Germany: 1. In the name of the Federal Republic, the present government must officially admit the fact of genocide committed by the German Third Reich against the European Roma/Sinti." "On December 21, 1982, the government of the Federal Republic made this determination: The Sinti and Roma suffered severe injustice under the National Socialist dictatorship. They were persecuted for racist reasons and many were murdered. These atrocities must be seen as genocide." "Approximately 500,000 Sinti and Roma suffered violent death under the Hitler dictatorship´. [...] These atrocities must be treated as genocide." "offer the public some kind of verifiable documentation or material evidence that would clearly and unambiguously support your charge of genocide committed against 500,000 Sinti/Roma, more or less. [...] I trust that you will agree with me that, in a state under the rule of law, a prosecutor has some obligation to prove his charges. In your speech you also stated 'racial discrimination must never again happen on German soil.' As long as you present no solid evidence for your grave allegations, these allegations constitute discrimination against the majority of Germans. I would be very grateful if you would inform me whether the federal German government possesses any verifiable evidence of the atrocities which you allege." Thirteen years later, in 1999, the federal government has still offered no documentary evidence in support of those allegations, unless an essay by Michael Zimmermann can be considered a response. Zimmermann's essay, bearing the bombastic title "The National Socialist Policy of Extermination Conducted against Sinti and Roma," was printed as an insert in the official German government weekly Das Parliament. 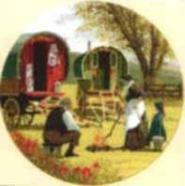 It dealt only with German gypsies, however, and contained no evidence for the alleged figure of 500,000. It also devotes a chapter to the parenthetical subject of "Sterilization and Prohibition of Marriage." A speech by German Federal President Dr. Roman Herzog, delivered on March 16, 1997, in Heidelberg and adopted word for word by the Sinti and Roma organizations, makes clear that the German government has no intention of proving, revising, or documenting its monstrous allegations. "The exhibition that we are opening today illustrates how discrimination of long duration culminated in persecution and murder. Almost 500,000 murder victims, of which over 20,000 were German Sinti and Roma – that is barbarism on a gigantic scale." "When the National Socialists came to power in 1933, around 20,000 gypsies were living within the borders of the Germany of that time." There is a slight problem here because Grattan/Puxon informed us in 1979 that "The Sinti organization is concerned with the problems of the approximately 50,000 German born Sinti." On September 27, 1992, the New York Times stated on page E5 that there are now 200,000 (two hundred thousand!) gypsies in Germany. So, here is a question for President Herzog: how can it be possible that the 20,000 gypsies who lived in Germany before World War II and who suffered 20,000 deaths through 1945 (20,000 – 20,000 = 0) had increased to 50,000 in 1979 and 200,000 in 1997? Please note that Puxon specifically mentions 50,000 gypsies as having been born in Germany and not having immigrated there. The only possible conclusion is that Herzog's politically correct statement that 20,000 German gypsies were murdered or sterilized cannot possibly correspond to the historic facts. "Around 8,000 German Sinti and Roma are living in Rheinland-Pfalz today. Most of these families, according to Krausnick, can point to at least 300 years of documentation in church registries as proof of native status." If 8,000 gypsies living in Rheinland-Pfalz in 1992 can point to "documentation in church registries as proof of native status," we can logically conclude that 1) they did not immigrate to the area and 2) they were not murdered or sterilized during the Third Reich. We should consider that Rheinland-Pfalz is a small province in Germany, and similar situations will prevail in the other provinces. Thus it follows that President Herzog's assertions cannot possibly be true. "Recent scholarship now indicates that more than a million Gypsies were murdered in the Third Reich, and that estimate rises as our research continues [...]"
"The fact was hardly mentioned that in addition to 6 million Jews, around a million gypsies were murdered in the same way." Here is additional evidence that the number of victims increases in proportion to the amount of time passed since the alleged murders. Let us now compare the newest "victim" figures to prewar population figures. "The number of Gypsies in Europe was estimated before World War II at anywhere from 750,000 to 1,000,000 or 1,500,000." Note that the New York Times gives no figures for Belgium, Holland, and Hungary; for these we rely on Grattan/Puxon. It is obvious that the total gypsy population amounts to over ten million for the year 1992. Before the War the number was around 750,000 to 1,000,000. Note also that the New York Times lists as its source "International Union of Romani." In view of figures like these, how can anyone speak of "genocide"? "Hitler himself ordered Himmler to carry out, without exception, the deportations of all Sinti and Roma to the extermination camps. Then they were systematically murdered, family by family, everyone from small children to aged grandparents. This occurred throughout the Nazi sphere of influence." Such is the official version in the words of Dr. Roman Herzog. We note that these amazing remarks by the highest representative of the German Government were made five whole years after the publication of the New York Times article. Germany's leading politicians were still telling the public such claptrap at the close of the 20th century, in the age of computers, microprocessors, and trips to the moon! "systematically murdered [...] everyone from small children to aged grandparents [...] throughout the Nazi sphere of influence"
The mathematical formulation of Herzog's statements proves that they cannot possibly be correct, although they accurately reflect his data. Nothing better demonstrates the scientific bankruptcy of official, politically correct history than the utterances of public officials such as German Federal President Herzog. "It has not been possible to reconstruct a consistent plan of genocide directed at the gypsies, regarding either conceptualization or implementation of such a plan." "The empirical and positivist approach to this topic is made possible by the pioneering studies of quite young scientists. By means of a very exact study of original documents, it is established that the numbers of Sinti and Roma victims were in fact far fewer than has been publicly stated. The numbers are around 50,000 rather than 500,000 (Michael Zimmermann, Essen / Jena)." Here again we encounter the old familiar "Holocaust exaggeration factor" of 10! It is interesting also that the Rundschau article appeared one month before the speech given by President Herzog. Obviously, presidential speechwriters make no attempt to stay abreast of contemporary historical research. 59 years have now passed since the end of World War II, and in that time no one has come forward with any objective or verifiable documentation supporting the "genocide" alleged to have resulted in the deaths of 500,000 gypsies. The scientific historian can only conclude that there was no such "genocide." Perhaps the best evidence of this is the number of gypsies alive, well, and living in Europe in the early 1990s: 10.8 million. This is a tenfold increase over their prewar numbers. The atrocity figures ceaselessly broadcast by the politicians and corporate media cannot possibly be true. They represent a propagandistic amplification of 1,000% in support of unjustified demands for reparations. No justification for a Berlin memorial exists, and there is no reason to build one. Politicians have no right to knowingly execute public policy on the basis of false and misleading data. "Almost 500,000 murder victims, of which over 20,000 were German Sinti and Roma – that is barbarism on a gigantic scale." So, "20,000 were German Sinti and Roma." We have to ask if President Herzog is aware that in the city of Pforzheim, on a single night in the spring of 1945, 17,600 German civilians – mostly women and children – were burned alive in the phosphorus bombing raid carried out by the Allies? Or that 20,000 civilians were similarly murdered in Cologne? Or that hundreds of thousands of other civilians perished in the fire-bombings of Hamburg, Dresden, and hundreds of other German cities, in blatant violation of the Geneva Accords? This was indeed "barbarism on a gigantic scale." Unlike the atrocity stories concocted by Germany's enemies in the two world wars, the atrocities committed against Germans are fully documented. Are the citizens of Pforzheim, Köln, Hamburg, or Dresden demanding Holocaust memorials in Berlin? Would any German politician support such a demand? Without a doubt, the Central Council of German Sinti and Roma have a right to promote the interests of German Sinti and Roma, but where do they get the right to represent all the gypsies of Europe? Since the number of Sinti and Roma who died during World War II is clearly far below 20,000, why build a memorial in Berlin for this particular subgroup, but not for German victims of far greater atrocities? On August 18, 1999, Heinrich Wefing wrote an informative article in Frankfurter Allgemeiner Zeitung article entitled "The Escalation of Memory" about the demands of the gypsy Central Council for a "memorial to the 750,000 Roma and Sinti murdered during the 'Third Reich.'" He pointed out that between 1997 and 1999 the number of gypsy victims magically increased by another 50%, from 500,000 to 750,000. My correcting letter to the editor on the subject was not printed, however. Ilse Schirmer-Vowinckel, "On the Fate of Gypsies in the Third Reich," this issue, p. 331-333. Carlo Mattogno, "The 'Gassing' of Gypsies in Auschwitz on August 2, 1944," The Revisionist 1(3) (2003), pp. 330-332. First published as "Sinti und Roma – Geschichten, Legenden und Tatsachen" in: Vierteljahreshefte für freie Geschichtsforschung 3(4) (1999), pp. 437-442. Translated by James Damon. Deutsche Presse-Agentur, "Kurz gemeldet: Der Zentralrat Deutscher Sinti fordert [...]", New Yorker Staats-Zeitung (New York City Newspaper, in German), August 7, 1999, p. 6. Donald Kenrick, Grattan Puxon, Sinti und Roma – die Vernichtung eines Volkes im NS-Staat, Pogrom Series No. 69/70, Gesellschaft für bedrohte Völker, Post Office Box 159, Göttingen 1981, p. 135. Dissertation, The Destiny of Europe's Gypsies, Sussex University Press, London, 1972, p. 185. Udo Walendy, "Zigeuner bewältigen 1/2 Million," Historische Tatsachen (Historic Facts) No. 23, Verlag für Volkstum und Zeitgeschichtsforschung. Vlotho, 1985. Otward Müller, "Zum Schicksal der Zigeuner Europas," Der Deutschamerikaner, Chicago, June 1982, p.5. Also: Deutsche National-Zeitung, Munich, Vol. 34, Apr. 27 to May 25, 1984, No. 18-22. Letter to Editor, Jul. 14, 1980. Letter to Editor, Sep. 24, 1980. Letter by this author to Mme. Novitsch, Oct. 26, 1980. Letter to the author dated Jul. 7, 1980. Christian Bernadac, L'Holocauste oublie – Le massacre de tsiganes, Ed. France-Empire, Paris, 1979. Letter from Institut für Zeitgeschichte, Aug. 11, 1980. Letter to the author, June 9, 1980. Letter to the author, June 27, 1980. Martin Gilbert, The Holocaust, Holt, Reinhard, Winston, New York 1985, p. 824. Reply from Correspondence Division of Die Welt to this author, Bonn, Dec. 7, 1980. Post card to the author, Dec. 9, 1980. Tilman Zülch, In Auschwitz vergast, bis heute verfolgt, rororo 4430, Rowohlt, Reinbek bei Hamburg 1979. Donald Kenrick, Grattan Puxon, Tilman Zülch, Die Zigeuner – verkannt – verachtet – verfolgt, Niedersächsische Landeszentrale für politische Bildung, Hannover 1980, p. 125. Helmut Kohl, "Rede des Bundeskanzlers zur Lage der Sinti und Roma. 171. Sitzung des Deutschen Bundestages am 7. November 1985," special print, distributed by the German Federal Chancellery. B16-17/87, April 18, 1987, pp. 31-45. Roman Herzog (Bundespräsident), Rede zur Eröffnung des Dokumentations- und Kulturzentrums Deutscher Sinti und Roma in Heidelberg am 16. März 1997 (Speech Delivered at Opening of Documentation and Culture Center of German Sinti and Roma in Heidelberg, Mar. 16, 1997). Bulletin, Presse- und Informationsamt der Bundesregierung, Mar. 19, 1997, No. 234, p. 259. See footnote 19, p. 37. Grattan Puxon in T. Zülch, Footnote 20, p. 33. Rene Wagner, "Sagen, was gewesen ist – Roma Ausstellung in Mainz," Frankfurter Allgemeine Zeitung, 27 Jan 1993, p. 7. "The number of Gypsies in Europe has been roughly estimated at 750,000" entry "Gypsies," p. 591, Vol. 13. Stephen Kinzer, "Germany Cracks Down; Gypsies Come First," The New York Times, Sep. 27, 1992, p. E5. T. Zülch, op.cit. (note 18), p. 45. "According to legislation on minorities, Hungary has an estimated gypsy population of almost half a million but unofficial estimates put the population at twice that." Grattan Puxon, in T. Zülch, op.cit. (note 18), pp. 44f., 54. See also Klaus Sojka, "Wo ist der 'Himmler-Befehl? '", Deutsche National-Zeitung, Aug. 13, 1999, p. 10. Zeitschrift für Kulturaustausch, Vol. 31, 1981, Issue 4, p. 418, Stuttgart. Maximilian Czesany, Alliierter Bombenterror. Der Luftkrieg gegen Europas Zivilbevölkerung, Druffel, Leoni am See 1987, p. 650. First posted on CODOH: July 16, 2012, 7 p.m.